Hockey Players – From SpongePedia, the biggest SpongeBob-wiki in the world! 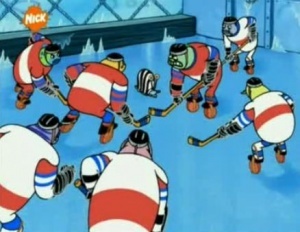 The Hockey Players just appear in the Episodes: Krabs a la Mode and Chum Bucket Supreme. In Krabs a la Mode, they play on the ice in the Krusty Krab Krusty Krab Swimming Pool. In Chum Bucket Supreme, they play in the Chum Bucket. Hockey Player: There it is. That little square guy has it. This page was last modified on 12 October 2013, at 19:20.